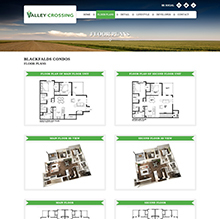 Valley Crossing is a new development that needed to showcase the area, the development, lifestyle and all with a new responsive website. Red Cherry created a new logo, branding packages, responsive website, search engine optimization campaign, pay per click campaign and remarketing campaign. 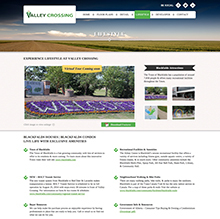 The website has Wordpress CMS so all pages can be easily updated by Valley Crossing. 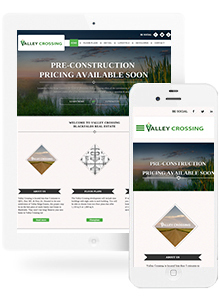 With a strong digital marketing campaign Valley Crossing is reaching its audience and generating qualified leads. 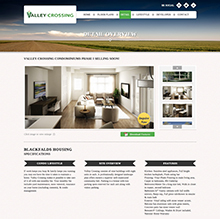 Very simple and clear calls to action deliver top level marketing messages about the development. Showcasing the property's using the interactive photo gallery's with detailed walk overviews. Search engine optimized website deliver results and drive qualified leads that give a higher ROI. 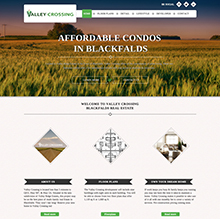 Attractive website yields high conversions rates that help generate qualified leads.